Nine explorers followed club member Ron Hoyt on a search for the ruins of Fort Benham. After a mile or two hiking, we spread out and found numerous remains of the old fort: The ruined chimney of the commandant’s headquarters, the post and hinge of gate, the corner of the wall, numerous deteriorating posts marking the burned wallz. It was very exciting – like being a kid on an Easter Egg hunt! Ron Hoyt supplied the following information about the fort. Benham Falls was named for James R. Benham who settled near the site in 1885. Benham was born in Harrisburg, Oregon about 1867 and came to Central Oregon with his parents in 1876. He attended school in a log cabin that was the first school at Farewell Bend (the original name for Bend). Fort Benham is located near Benham Falls on the Deschutes River near Bend, Oregon. This fort was built as a movie set for the filming of the 1955 movie “The Indian Fighter” starring Kirk Douglas (the opening scenes of the movie were filmed along the Metolious River). This movie was the first picture from Kirk Douglas’ Bryna Productions. 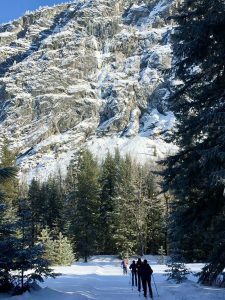 The 4000-foot square fort was built under a Special Use Permit from the Deschutes National Forest to the Bend Chamber of Commerce. 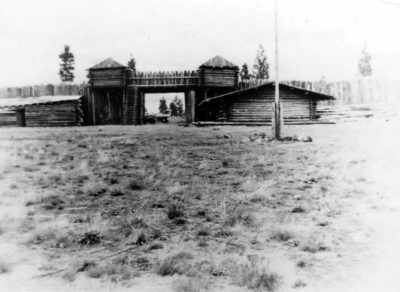 The fully-featured stockade measured 200 ft. x 225 ft. and belonged to the Bend Oregon, Chamber Of Commerce; it was built by a local construction company. The Chamber spent $30,000 to build the “Chamber Fort” at Benham Falls where the Kirk Douglas classic “The Indian Fighter”, Disney’s “Tonka” (later was renamed “Comanche”), and “The Way West” with Sally Field and Walter Matthau were filmed. In 1957 some scenes of the movie “Oregon Passage” were filmed at the fort. In 1960 and 1961 the fort was used in a number of episodes of the TV series “Have Gun Will Travel”. The fort brought over $1 million to the local economy in the eight years it stood and opened the doors of Central Oregon to filmmakers who still use the area for major motion pictures today. In 1962 a forest fire burned part of the area surrounding the fort which affected its usefulness as a movie location. So the fort was demolished in 1963, later burned and the area replanted. Today the area is covered with 50 year-old pines but remnants of the fort walls, the main gate, and the large fireplace and chimney can still be found.